Congratulations to Steven Cosnick, the winner of our November 2017 Hotshots contest. 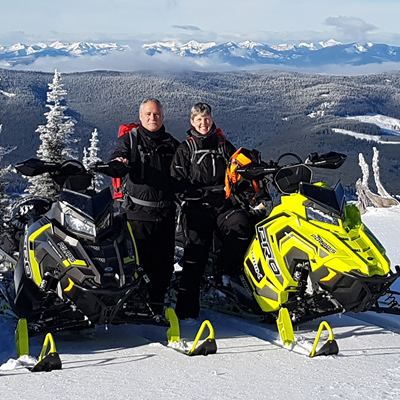 Cosnick, who’s from Sherwood Park, Alberta, received a Companion Rescue Skills Course from Trigger Point Snow Services. 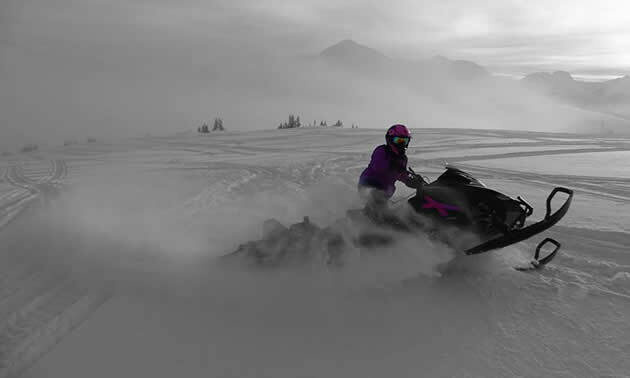 As usual, we caught up with our winner to talk about sledding in McBride, B.C., the day he took this photo and what the sport means to him. When and how did you get into sledding? For as long as I can remember my father would go sledding every Sunday when the snow started flying. We rarely got enough snow around home to ride right from the house but when we did, he would take me out through the fields around the house when I was young. That was the start of my addiction. The very first sled that I was able to ride around on my own was my father’s 1995 Formula SS 670. This was in the winter of 1996. I thought it was the best thing in the world to be able to drive around by myself; not far, mind you, as he would not let me leave the fields around the house. When I was able to put enough money aside, I bought my first sled. It was a 1999 MXZ 600. My father and I rebuilt the engine and put some go-fast parts on it. 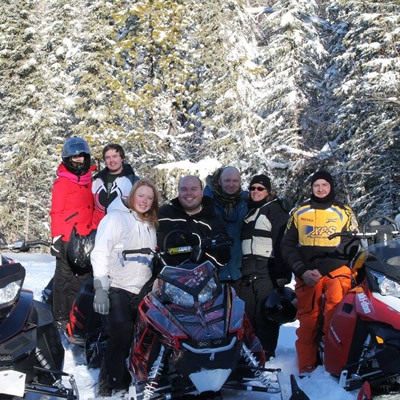 For my entire life, I have been a Ski-Doo guy. I have owned quite a few: a 1999 MXZ, 2005 Renegade, 2008 Renegade, 2011 MXZ and a 2015 Summit. A few years ago, some close friends got me hooked on the power of their turbo Vipers so now I’m currently riding a 2014 Yamaha Viper 163 with an Alpine Motorsports Turbo kit, running 10 pounds of boost. I do miss the Summit and one day hope to be able to have both. Why is McBride your favourite destination? I spend a lot of time exploring Renshaw. There is always a new area to explore every time you go. You never have to ride the same spot twice, other than the trail system in. 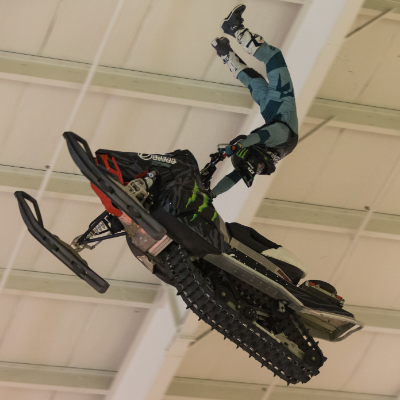 The possibilities are endless and there is every type of riding level available—from novice playing in the meadows to the extreme hill climbing. I have been going to McBride for the last six years since I have moved to Alberta. It hasn’t disappointed me yet. It always has good snow and usually, we get at least one clear day in per trip. There are always good people in town and great places to stay. 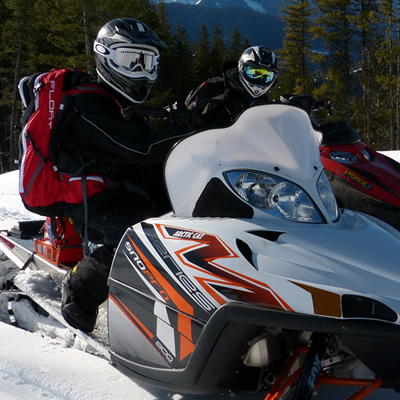 It’s a sledder’s dream. That is a tough question to answer. I like it all, to be truthful. I am not one of the extreme riders, but I do like to spend my time climbing some hills and testing the machine to see how far it can take me. The meadows are so much fun when there is fresh snow and you can just lay the sled over on its side and carve with the snow splashing up in your face. The trails are super fun to run along when they are groomed and smooth as glass. Jumping is not something I do a lot of, but when you find that right spot, I could spend all day playing there. It all starts with the planning of the trip. We make sure everyone in the group knows the plans for the day and where we are riding. We never take anyone outside of their comfort or skill level. We have a contact person that we let know where we are going and roughly what time we expect to be off the mountain. We all have the main safety gear (beacons, shovels, probes, avy bags and GPS). I personally have started getting brighter gear so that it’s easier for people to see me, instead of all the black I used to wear. If you could ride anywhere in the world, where would it be and why? I do not think I have a destination, really. I really really like to do some of the clinics offered by the professionals—such as Chris Brown in Whistler, Burandt’s Backcountry Adventure or Carl Kuster Mountain Park. This year, I would like to visit Grizzly Lodge. Tell me about the day you took this photo. The picture is of Cindy Rougoor carving on her 2014 Summit X 154. Everyone else in the group had kept going down the mountain while we stopped to play in the little bit of daylight that was left. We had come across a small meadow that was untouched. I figured it was a good time to get some pictures of Cindy doing what she likes best—carving. I added a little flare to the picture by turning it black and white and highlighting just the purple and pink, which are her favourite colours. What does sledding mean to you? Sledding is my time to relax. To forget the rest of the world exists, except for the people who are with me, and enjoy the views nature has to offer. Sledding is my escape from the world. Monday to Thursday, all I can think about is Friday afternoon when I will be heading to the mountains. Through the summer, all I can think about is the first trip and all the fun that comes along with it. Nothing beats sitting on top of the mountain taking it all in with people who appreciate it just as much as I do. Want to win cool prizes? You can enter your photos in this month’s contest. Visit our Hotshots gallery to see all entries.